We are all limited by the physics around us so we have to adapt in order to get things done. In this case the getting thing done is getting water off of your body. If left on the body water can collect dust, form mildew, provide unwanted heat exchange among other things. So it is essential for mammals to get dry. Water has a defined surface tension and density whereas your skin and hair on your body might change. The gravity does not change unless you are in space (so maybe getting dry in space is not such a big deal). So how do mammals with hair get dry? This was the question researchers asked. 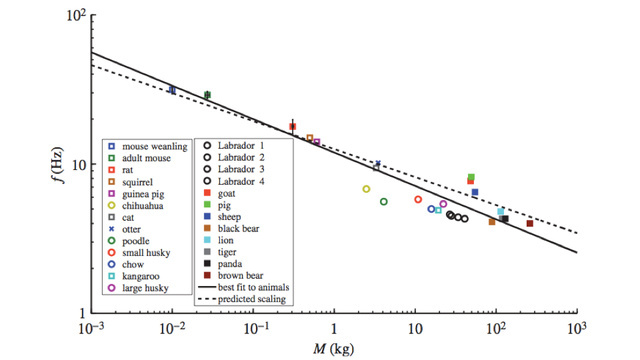 And more interesting: What frequencies are needed for a dog and other animals to shake water from their body? The conclusion? In order for a small animal (like a mouse) to get dry it needs to shake faster (30 Hz) whereas an animal like a dog the size of a Labrador (4 Hz) or larger say a Panda bear would need far less shaking in order to get the dermal tissue dry enough. Loose skin also factors into the equation. If an animal as small as mouse shakes like a Panda he would not get dry.